« When Did Herbert W. Armstrong Teach the Work Would End? Norman Edwards, a one-time GCG member, sent out an email stating, “SETTLEMENT AGREED!”. He has been involved with a particular property in Michigan for over three years and a related lawsuit for over two related to his PABC. We presently intend to produce a small brochure explaining the concepts behind the Port Austin Bible Campus and bring it to a wide Sabbatarian audience: Church of God groups, Church of God Seventh Day groups, Messianic Jewish groups, Seventh Day Baptists and others. We hope to make our facilities available to these groups for low-cost camps and retreats next summer. We would like to invite anyone who is interested in helping us with these plans to come and visit during the upcoming Thanksgiving holidays. We realize that this will not be practical for most of you, but for a few, it might. Some are already planning to come. Please call or e-mail if you do, so you can be assured a room on campus. If you would like to help in some way, but cannot come to the Thanksgiving meeting, please e-mail or write to us. We intend to produce another issue of Servants’ News as soon as possible, and hope to keep publishing it every two months. After three long and difficult years, we now feel more determined than ever to make this ministry a reality and a blessing to others. IT IS FURTHER ORDERED AND ADJUDGED that there is no admission by either party of any wrongdoing in their agreement to amicably to resolve the issues in the within cause and all claims and counter claims in this cause not provided for in this Judgment are hereby dismissed with prejudice. It is further the intent of this Judgment for the parties hereto to waive any claims or causes of action either might have against the other as of the date of entry of the Judgment, whether or not plead in this cause of action. IT IS FURTHER ORDERED AND ADJUDGED that the plaintiff, Williams, and the Defendant, Edwards, acknowledge and agree that Homer Kizer has not, is not, and will not be authorized by Terry Monte Williams to speak or write on behalf of Plaintiff, Williams. IT IS FURTHER ORDERED AND ADJUDGED that Plaintiff, Williams, shall vacate the premises he occupies on property titled in the name of Defendant Trust within 60 days of entry of this Judgment. IT IS FURTHER ORDERED AND ADJUDGED that no costs are awarded to either party. This is a person who has, unless he or she brings forth fruit worthy of repentance, marked himself or herself for death in the lake of fire. Edwards is, today, such a person. Prayers for him should be for his repentance; for today, those members of the Port Austin Sabbatarian Community that also form the Port Austin Bible Center have withheld forgiveness of Edwards’ sins (John 20:23) because of his lack of repentance. Although I like Norman Edwards personally, I have not attempted to become familiar with enough details of this case to have much of an opinion about what happened–and apparently the judge did not see much to this and did not seem to think Norman Edwards was in the wrong. FWIW, I think the real problem here is that like some since the apostacy in the Tkach WCG, Norman Edwards has considered that many outside of the COGs are Christians as well. This, in my opinion, is a mistake. It is not there there are no possible Christians outside the COGs, but the amount would be quite small and I believe that God would draw them into the COG if possible (in some lands and circumstances this may not be possible in this age). The Similarities and Dissimilarities between Martin Luther and Herbert W. Armstrong This article clearly shows some of the doctrinal differences between in the two. At this time of doctrinal variety and a tendency by many to accept certain aspects of Protestantism, the article should help clarify why the COG is NOT Protestant. 5. The Sardis Church Era was predominant circa 1600 A.D. to circa 1933 A.D. Discusses Seventh Day Baptists, Seventh-day Adventists, and COG-7th Day. Similarities and Differences Between the Jehovah’s Witnesses and the Churches of God Both groups have some interesting similarities, but many major differences. 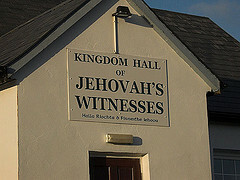 Would you like information on how to deal with Jehovah’s Witnesses? SDA/COG Differences: Two Horned Beast of Revelation and 666 The COG is NOT part of the Seventh-day Adventists. This article explains two prophetic differences, the trinity, differences in approaching doctrine, including Ellen White. Five Dissimilarities Between The Church of Jesus Christ of Latter Day Saints and the Church of God The COGs are not related to the Mormons and this article explains five differences. This entry was posted on Wednesday, November 14th, 2007 at 6:51 am	and is filed under COG News. Will Many Not Expect The End?